Tonight I finally placed the last of the 240 LEDs that will be attached to the suit itself. The last 10 LEDs, which are the cut-off stragglers from the various sections of the suit, will make up the part that attaches to my baseball cap, like the last suit. I’ll run a little wiring harness up the back of my neck for that. 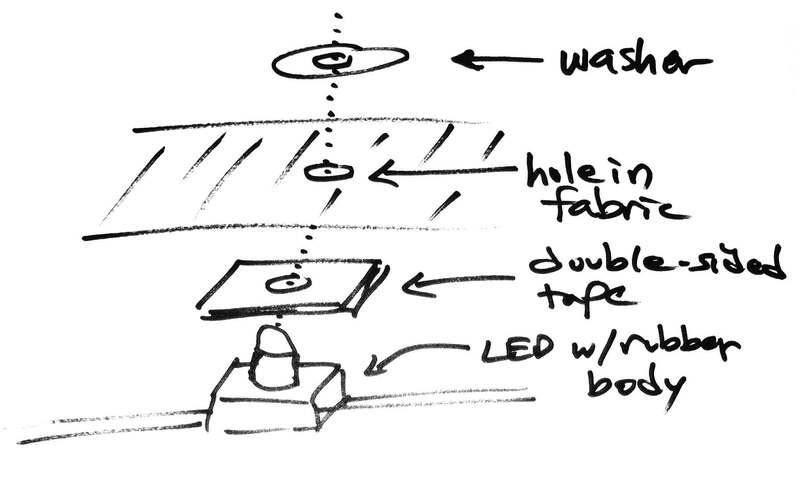 For each LED that I’ve placed on the suit, I’ve also outlined the location with a white fabric marking pencil. That will make it easier to know where to put the LED holes when it’s time to actually punch all these guys through the suit fabric. Now that the strands are all basically in place I can start wiring the thing up. I’ve been brutal up to this point. When I’ve placed a section, such as a leg, I just snip the strand right off at that point. Each of those snip points will need to be spliced to the next strand (in order – the strand is a single serpentine, directional path), and inject power in at each of those splice points. It’s gonna be a lot of wiring, but it will let me test the LEDs in situ, hopefully within a week or two. I had a productive weekend hacking on the suit. 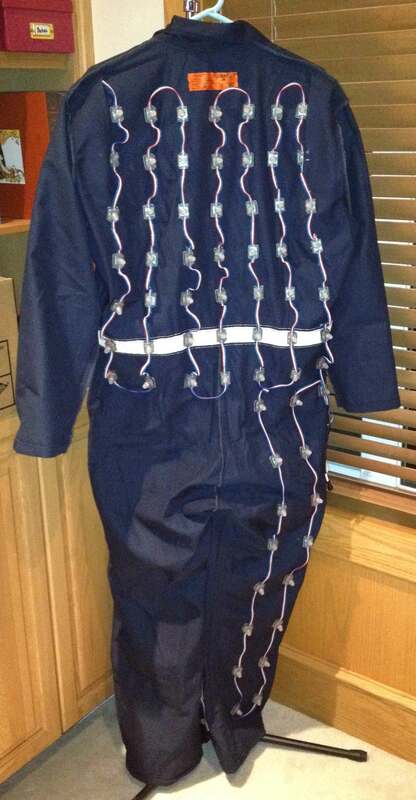 I positioned the 49 LEDs that are on the back of the suit in a 7 x 7 grid. I’m getting pretty excited to get the positions all finalized because I want to wire the suit together and actually get all 250 of them running mounted in their actual spots. I also successfully integrated a Sparkfun Bluetooth Mate Gold into the prototype suit electronics and after some programming was able to control the suit wirelessly from a laptop. That’s a temporary test setup – I acquired a used HTC Dream (T*Mobile G1) Android phone, and I’m writing a remote control program for it. That’ll be my user interface for more complicated operations such as entering text that scrolls across my back and chest or putting myself into “flashlight mode.” I will still have the simple handheld keypad that I had last time for tapping in the beats and doing more basic animation control.